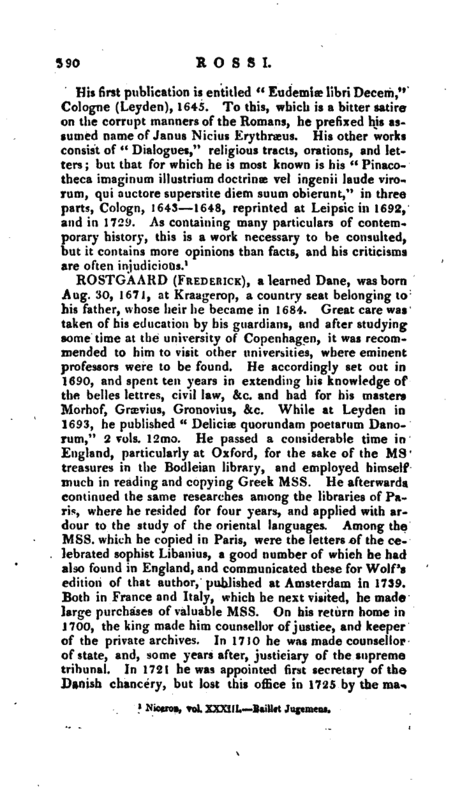 , a learned Italian, who assumed and is generally known by the name of Janus Njcius Ery­Thræus, was born at Rome, of a noble, but not opulent family, about 1577. He studied in the college of the Jesuits, and before he was nineteen years of age had made such progress in the law, that he was permitted to give lessons on the subject. These were so much admired by a magistrate of eminence, that he appointed Rossi his auditor; but as this gentleman died the same year, all his hopes from his patronage were disappointed. 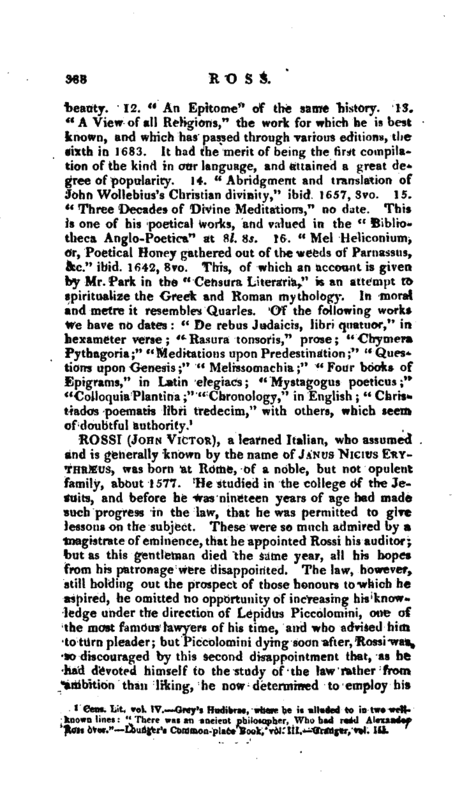 The law, however, still holding out the prospect of those honours to which he aspired, he omitted no opportunity of increasing his knowledge under the direction of Lepidus Piccolomini, one of the most famous lawyers of his time, and who advised him to turn pleader; but Piccolomini dying soon after, Rossi was so discouraged by this second disappointment that, as he had devoted himself to the study of the law rather from ambition than liking, he now determined to employ his | time in the study of the belles lettres. With this view he became a member of the academy of the Umoristi, where he read several of his compositions, the style of which was so much admired by Marcel Vestri, secretary of the briefs to pope Paul V., that he invited Rossi to his house, to assist in drawing up the briefs, and with a view that he should be his successor in case of himself rising to higher preferment. 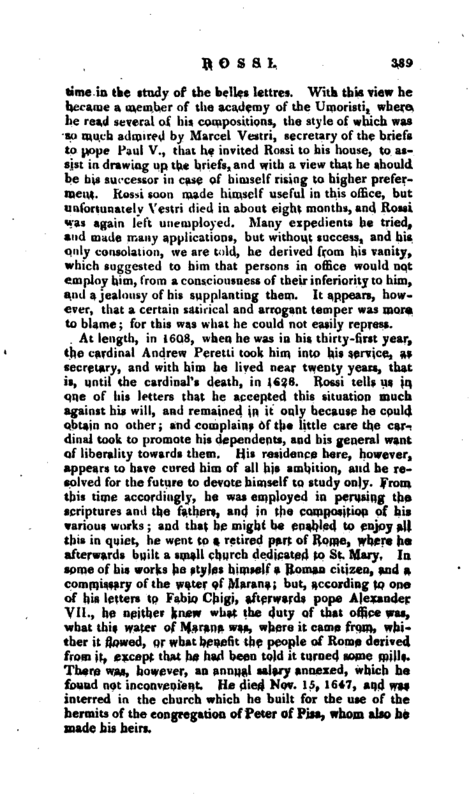 Rossi soon made himself useful in this office, but unfortunately Vestri died in about eight months, and Rossi was again left unemployed, Many expedients he tried, and made many applications, but without success, and his only consolation, we are told, he derived from his vanity, which suggested to him that persons in office would not employ him, from a consciousness of their inferiority to him, and a jealousy of his supplanting them. It appears, however, that a certain satirical and arrogant temper was more to blame; for this was what he could not easily repress.